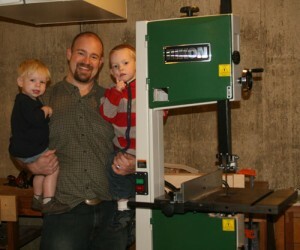 Congratulations to Matt Mills of Fort Wayne, Indiana on winning Highland Woodworking’s Rikon Bandsaw Giveaway! His name was drawn from over 300,000 entries. HW: How did you get into woodworking and what sorts of woodworking do you do? Matt: I had been fiddling around with woodworking for about 5 years before I got serious about a year ago, building furniture for the house. I do a lot of hand tool work, and really like to incorporate hand plane use into my work. I enjoy the feeling of manually working the wood with a hand tool. I have built a couple of tables for our house, a train table for my son, a hobby table for my wife. Right now I only get to put in about 5-6 hours a week of woodworking, but my favorite time is working in my shop. I inherited a bunch of hand tools from my wife’s grandfather, and have been refurbishing them for awhile now. My next big purchase was going to be a bandsaw, but now I’m excited to be able to use the money I would have spent on that to purchase a bunch of new hand tools instead! HW: What was your reaction on finding out that you won? Matt: I did the bandsaw dance! had my 3 year old and my 18 month old with me, and I was checking email down in the basement when I got the notice. I couldn’t help it – I jumped up and danced around in a circle with my kids singing “we won a bandsaw” when I found out. HW: What is the first project you have slated for your new bandsaw? Matt: I’ve actually got a project lined up already: I’m going to to resaw some cherry boards to make a small toybox for my boys for christmas. The toybox will feature handcut dovetails, so I’ll have a little bit of hand tool work in there as well! HW: That sounds great! Thanks for chatting with us…any final words? Matt: I’m just really excited! I think the bandsaw and dust collector will make a great addition to the shop. 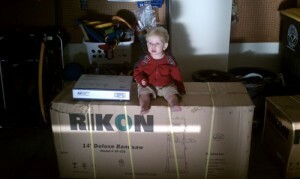 Congratulations again to Matt for winning the Rikon Bandsaw Giveaway! You can be a Highland Woodworking giveaway winner too! 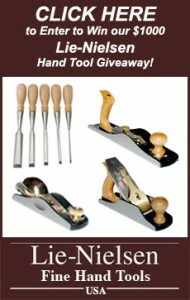 Enter to win our Lie-Nielsen Hand Tool Giveaway today to win more than $1000 of Lie-Nielsen Hand Tools! Click the image to the right for more details. Just used the Woodslicer Resaw blade on the new bandsaw. First I cut a piece of hard maple for some drawers. This was a 5 inch wide cut. The Woodslicer resaw blade is amazing, it cut through the hard maple like butter. After that I set up and cut a piece of 12 inch wide 8/4 cherry for the toy boxes. The performance of the Woodslicer blade was unbelievable! I am really enjoying having the bandsaw in the shop! Curtis Turner: Turning a Chisel Handle Winter 2011 catalog NOW AVAILABLE!